This isn't your typical yoga space. Mission Brewery in downtown San Diego was the venue for a Movember Foundation fundraiser featuring a yoga flow led by Lauren Padula, with live music spun by DJ Justin Kanoya. Lauren Padula leads a yoga session to benefit the Movember Foundation. 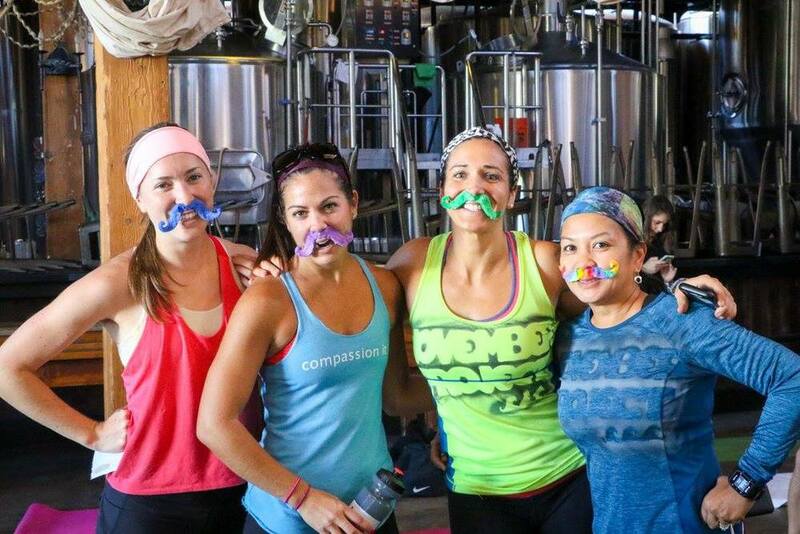 A couple of months ago, my friend and San Diego fitness community leader, Lauren Padula, contacted me about an event she was putting together to benefit the Movember Foundation. The event, Do Mo Yoga, took place on November 7, 2015. 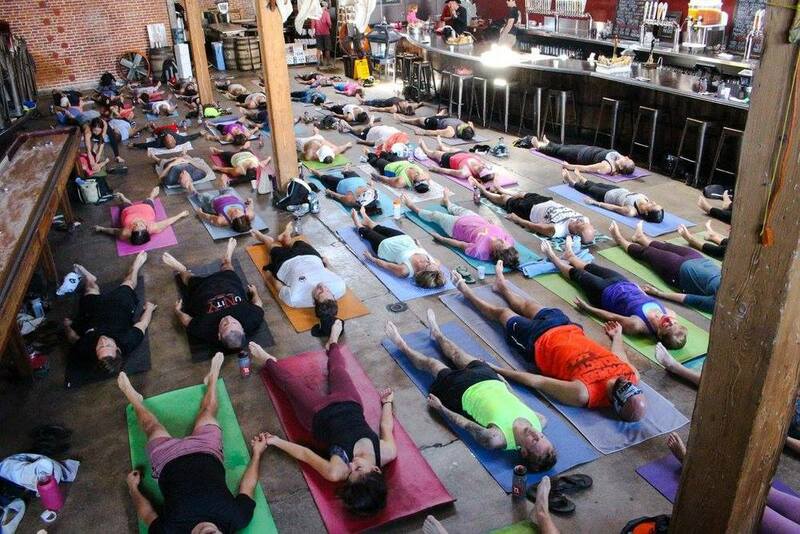 The plan was to invite both men and women into Mission Brewery in San Diego for a morning of yoga, followed by a post yoga flow party. Sounded like a pretty good time and I'm always up for to DJ a yoga party. Mission Brewery proved to a great venue for this event. It was well attended, raised significant funds for Movember and for me was fun seeing many of my November Project San Diego friends (another fitness group that Lauren leads every week). The Do Mo Yoga brought out my facial hair faced yogi's ... of all genders. Photos courtesy of Alex O'Nelio and John O'Nelio. Gin Wigmore is a singer-songwriter from New Zealand. Her latest album is titled, Blood to Bone. While no one is going to duplicate Amy Winehouse. Gin Wigmore comes pretty close. Admittedly her sound is new to me, despite having a third album recently released. Hailing from New Zealand, perhaps a fellow single-named Kiwi, that Lorde girl, with huge pop success has overshadowed Wigmore a bit. But her high pitched, yet “throaty” voice is what perked my ears when I heard it the other day. The sound is a little rock with some pop beats. Spotify lists related artists such as ZZ Ward, Ingrid Michaelson, Kimbra and Anya Marina … all faves of mine. And "Gin" is about the greatest nickname I've ever heard for someone named Virginia. Everything old is new again. When I started DJing in the early 90s I used turntables and lugged around crates of records -- yes, I too have that badge of honor. After using an assortment of controllers, CD-Js and other DJ gear, I’m incredibly excited to add a turntable set-up to my gear line-up. I opted for the Reloops because of their MIDI functionality and other features such as digital display and torque adjustment. It’s a nice hybrid of an analog turntable and digital DJ controller. All of my past set-ups were built on streamlining and convenience. A turntable set-up is neither, in fact, in some ways it’s more work to set-up and even more work to operate. But it’s 100x more fun. I’m also looking forward to honing my craft as a DJ, something that really can only be done with a couple of pieces of vinyl and ‘tables. The Reloop RP-8000 turntable, with it's MIDI functionality, adjustable torque and a host of other features is part of a new breed of DJ turntables. What = The things we do. For example, I am a DJ. I play music at parties, that’s what I do. Why = The reason we do things and when you know why you are doing it, and you believe in that why, you put more into the what. Pitbull Audio is the perfect place for a DJ to come into and try out various controllers and turntables. Nearly every piece of gear is connected to it's own computer. San Diego DJ’s and audio professionals are pretty lucky when it comes to shopping around for new gear. Between DJ specific stores, Guitar Centers and other places there are plenty of choices. When I was shopping for my new turntable set-up, I checked with a handful of online sources as well as one local place … and I went local. Pitbull Audio has been a great online retailer for the past few years and just over a year ago opened up a location in National City, CA, just south of downtown San Diego. I was impressed with their selection and even more impressed with their set-up. The DJ section of the store not only has nearly every popular controller on display, but they are also hooked up to their own Macbook so customers can try them out. Customer service is great and because of my rather large order, they did a great job working with me on the pricing and helping me stay within my spending budget. If you are local to San Diego check them out. And if you’re not, be sure to visit their website. I’ve been loving cast iron pots and pans for many years. But lately, I’m using my various Lodge skillets exclusively. I also use Lodge Dutch ovens on our family camping trips. No other pan can go from the cooktop, to the oven to the open campfire flame like a solid piece of cast iron. You’ll have a juicy piece of chicken with a delicious and crispy exterior skin.